I didn’t get a whole lot of knitting done over the weekend but I did manage to make 8 of these blocks. The quilt pattern is called Morning Star and it’s from the book Nickel Quilts by Pat Speth and Charlene Thode. The patterns in this book all start with 5″ blocks and the theory behind it is that you should cut all your leftovers from other quilts into 5″ blocks and also cut a 5″ block or two every time you buy some new fabric. Then, when you want to make a quilt you’ve got a ready supply. 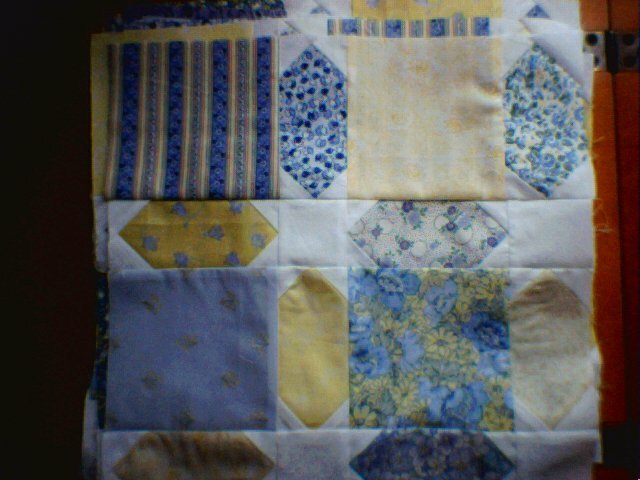 Sounds good in theory and it works well for scrap quilts but this one I’m doing is for my blue and yellow bedroom so I actually cut up a whole bunch of fat quarters to make this quilt. Sometimes it sort of disturbs me, the whole process of quilting . . .just go with me here for a minute . . . we buy big pieces of fabric . . . we cut the big pieces of fabric into teeny pieces of fabric . . . we sew the teeny pieces of fabric into big pieces of fabric to make a quilt. Hunh. It all just seems a little absurd now and again. See, at least with knitting you start with something in a raw state – a skein of yarn – and turn it into something in a finished state – a sweater or bag or whatever. Not that I’m saying knitting is better than quilting – it just seems slightly more logical, ya know? So, on the knitting front, once again I have to report that the Charlotte Bronte shawl is progressing nicely, as are the purple jacquard socks. Sigh. No finished objects in sight. Heavy sigh. Guess I’d just better – knit on!